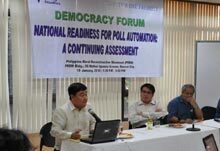 As the nation prepares for the May national elections, the National Institute for Policy Studies (NIPS) held a democracy forum on 19 January 2010 at Quezon City to discuss whether the country is ready for poll automation. With the support of the Friedrich Naumann Foundation for Liberty, NIPS invited teachers and sectoral group representatives to learn from the Commission on Elections (COMELEC) about its automated election system and the current status of its preparations. Attorney Ferdinand Rafanan, director of the COMELEC’s law department, started the discussion by saying that an automated electoral process is not new. The Optical Mark Reader technology was partially used in the 1998 Autonomous Region in Muslim Mindanao (ARMM) national and local elections. It was fully implemented in the 2008 ARMM elections. This year COMELEC is preparing to conduct the country’s first nationwide fully automated elections: from the counting of votes to the transmission and canvassing of results. He then continued to explain the new voting process with the Precinct Count Optical Scan (PCOS) system, the canvassing and transmission of results and both manual and digital security measures. Atty. Rafanan also discussed the different contingency plans in place should the automated systems malfunction. He also reassured the participants that should all backup measures fail, elections will still continue. The machines are only for counting, he stressed. With regards to COMELEC’s preparations, Atty. Rafanan said that the delivery of the PCOS machines continues. They are also conducting lab and field testing. He said that Systest Labs in the US, an independent systems certification company, is also working on certifying the source code. Attorney Solis also recommended some possible solutions such as: independent parallel review of the source code, early release of sample ballots and educational paraphernalia and safekeeping measures for PCOS machines. Ramon Casiple, chairperson of the Consortium on Electoral Reforms, also reiterated the need for voter’s education. If the machine fails, the teachers can count the votes manually. What he foresees though is a breakdown of another kind. The public will not know how to accomplish the ballot. He said that majority will only encounter the system for the first time on Election Day. Given these grim opinions of Casiple and Solis, NIPS will organize a follow up forum to assess again the country’s readiness for poll automation. Click here to listen to Atty. Rafanan's complete talk. Click here to listen to Atty. Solis's complete talk.